The 5.3-inch Samsung Galaxy Note shocked us when it launched with such a huge screen in 2011, but while the original phablet was a beast at the time, it lacked the polish and smoothness of Android 4.1 Jelly Bean. Samsung however had promised it will actually bring the update to the device, and is now closer to delivering on its promise. Why? The company has published the manual for Android 4.1 Jelly Bean on its official website and while that doesn’t necessarily mean the update is soon coming, it is a good hint at that. 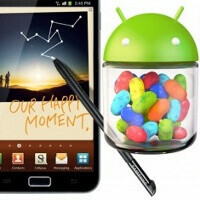 Androird 4.1.2 is expected to arrive on 2011 devices like the Samsung Galaxy Note and the Samsung Galaxy S II in January to February. Man I still want to get one. I don't need a big house, i'm a single man now... Stayed in Germany to help raise my sons... You can talk all the s#%t you want... But my debts are 0, I learned to save, like a good German... Now lie and say you're debt free... pee pee man. I can't wait for the update. I'm still enjoying my note and jelly bean would make it even better.